Due to the generosity of The Round Lake Area Exchange Club Hometown Heroes sponsors we are excited to announce two January Heroes; U.S. Marine Lance Corporal David Pickerall and PFC Andrew Pickerall, residents of Grayslake. Both Marines were registered at the Clubs website by their Father, Barry Pickerall. Andrew recently completed boot camp and additional training and is now at Fort Leonard Wood, MO, while David is at Camp Lejuene in North Carolina, after serving a six month tour in Afghanistan. 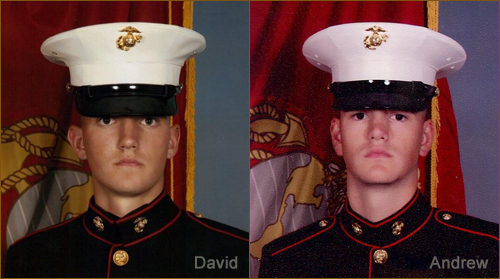 Both Marines are Grayslake Central High School graduates, David from the class of 2008 and Andrew from 2010. Both “Hanging with the Heroes” care packages will be filled with peanut butter cups, candy bars, cookies as well as their personalized “Hanging with the Heroes” shirts and letters from Round Lake Area School District 116 students. The Club will present the Pickerall family with plaques on behalf of the January Hometown Heroes at their January 12, meeting. The meeting is held at Panera Bread in Round Lake Beach, 7:30 a.m.
Any and all military personnel serving overseas or in the USA from any of the Round Lake Areas, Hainesville, Fox Lake or Ingleside qualify for the program. Five minutes is all it takes to get them registered. If you have a neighbor, family member, friend, employee, employer, etc. serving in the military please register them by going to our registration page. We look forward to announcing the December Hometown Hero.